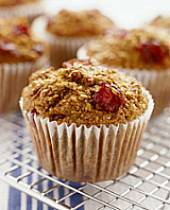 One of the best cranberry bran muffins you'll ever taste made with creamy sour cream. You may use muffin pan liners if desired instead of buttering the tins. Preheat oven to 400 degrees F/200 degrees C. Generously butter 12 muffin tins, or line 12 muffin tins with paper muffin or cupcake liners. In a large bowl with an electric mixer cream together the butter and the brown sugar until the mixture is light and fluffy, beat in the egg, the sour cream, and the molasses, and stir in the dried cranberries. In a bowl whisk together the flour, the baking soda, the salt, and the bran, add the mixture to the sour cream mixture, and stir the batter until it is just combined. (The batter will be lumpy.) Spoon the batter into the prepared muffin tins and bake the muffins on the center rack in preheated oven for 15 to 20 minutes, or until they are golden brown and springy to the touch. Turn the muffins out onto a wire rack and let cool completely. this was a fantastic treat, simple to make and was mouthwatering, really nice straight out of the oven! Delicious, 2nd batch I added a few raisins to make up the cup required. They were just as tasty.